Back to where it all began, Serbian six-string-slinger rediscovers most delicate vibe of his oeuvre. 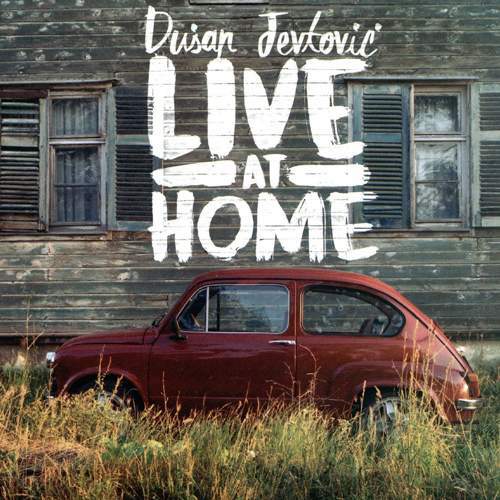 Going from strength to strength, this Barcelona-based artist has been returning to Kragujevac, his hometown, more than once – part of 2015’s "Live" was recorded on the turf that Jevtović revisited two years later to deliver “Live At Home” which couldn’t be more different from its free-download predecessor. There’s a newly found nuance to Dušan’s usual rawness on the record whose sales would fund the guitarist’s next album, folk song “Soko Bira” gaining sampled vocals now to augment not only the frantic filigree of “Al Aire” but also the tremulously twangy “Angel” they’re appended to, while rock element is downplayed in favor of jazz volatility. More so, the concert captured here is an ensemble effort, a quartet experience, rather than main instrumentalist striving for support from sidekicks, and pieces such as the title track of "No Answer" are given glass-like fragility to become transparent and robust at the same time. On-stage, melodies get wrapped around the listener’s ears to seep into their psyche, as the tinkle of Vasil Hadžimanov’s keys tickles Dušan’s slightly strangulated strings, while the keyboardist’s own “Ohrid” and “Briga” adding infectiously exotic fusion to the heady potion of sound and feeling that emanate from the fretboard and hang in the air. On the other hand, down-to-earth and closer to home, village voices emerge again in “Babe” to outline the drama of love, and “New Pop” runs along a sensual groove, chiseled with the help of Pera Krstajić’s bass and Pedja Milutinović’s drums, where Jevtović’s bluesy licks are at their most frivolous. Breathing, yet breathtaking, these performances are delight for connoisseurs and uninitiated alike.